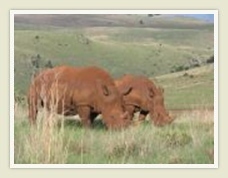 -- let Touring South Africa take you! 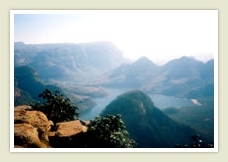 Travel from Johannesburg to Mpumalanga province via Lydenburg, and on to the Panorama route. Along the edge of the escarpment , visit Three Rondavels lookout point, over the deepest part of the scenic gorge, the Blyde River Canyon, number 3 after the Grand Canyon and the Fish River Canyon (weather permitting), then visit the magnificent Bourke's Luck Potholes, and the awe-inspiring view over the Lowveld towards Kruger National Park from Wonderview, the top part of God's Window with the best view. Overnight in Graskop area at a country inn on a bed and breakfast basis. After breakfast, enter the famous Kruger National Park and continue through the reserve on a photographic safari, looking out for animals in this unique wilderness area, where Africa's BIG 5 roam in their natural habitat. Overnight in one of the rest camps on a bed only basis, for flexibility. -- Dinner restaurant is available, or self catering can be great fun, listening to the night sounds outside your chalet! -- The same for breakfast, but usually we leave before breakfast on safari, to have the best chance of encountering the early morning wildlife. If we do not return to the same camp after the early morning safari, we have time for breakfast elsewhere at one of the picnic spots. Arrive in Johannesburg/Pretoria in the late afternoon. Accommodation and full English breakfasts where included. Please feel free to contact us if you are interested in this tour package, or if you would like us to tailer make a package for you. Overnight in one of the rest camps on a bed only basis. Accommodation and full English breakfasts, where included. where one of the days is spent around Swadini resort and the Blyde River Dam. The extra 5th day includes a day on a private game reserve in the Kruger National Park area -- it is an experience really worth considering, seeing that you get a closer and more personal and photographic experience with the wildlife and the people of this region. - Please CONSULT YOUR DOCTOR before visiting. This is a popular tour which includes Kruger National Park, Blyde River Canyon (the Panorama), and a Private Game reserve. 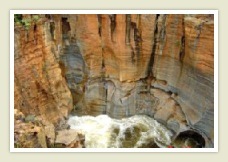 Travel from Johannesburg/Pretoria to Mpumalanga province via Lydenburg, and on to the Panorama route. Along the edge of the escarpment , visit Three Rondavels lookout point, over the deepest part of the scenic gorge, the Blyde River Canyon, number 3 after the Grand Canyon and the Fish River Canyon (weather permitting), then visit the magnificent Bourke's Luck Potholes, and the awe-inspiring view over the Lowveld towards Kruger National Park from Wonderview, the top part of God's Window with the best view. After breakfast, enter the famous Kruger National Park and continue through the reserve on a photographic safari, looking out for animals in this unique wilderness area, where Africa's BIG 5 roam in their natural habitat. Return late afternoon and overnight on a bed and breakfast basis. 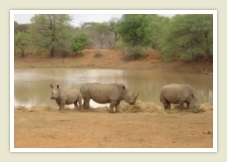 Drive to the private game reserve, which lies in the greater Kruger National Park area. The reserve boasts a wide diversity of wildlife, including the Big Five animals: Lion, leopard, rhinoceros, elephant, and buffalo. After settling into camp, enjoy a light lunch. 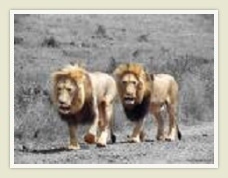 Depart then on a late afternoon game drive (safari) in open 4x4 Game drive vehicles. Stop out in the bush for sundowner drinks, and continue the game drive after dark, using spotlights to look for nocturnal animals. Return to the camp for a traditional South African meal around the camp fire, or on the deck. Early morning coffee is served at the Lodge, before setting off with your ranger and tracker for a morning game drive. After a hearty late breakfast, we depart the Limpopo/Mpumalanga province(s) via the tropical fruit farming area, to arrive in Johannesburg/Pretoria in the late afternoon. Please feel free to contact us if you are interested in this package, or if you would like us to tailor make a package for you. This is a VERY popular tour of Kruger National Park, the Blyde River Canyon (the Panorama), Swadini area, and a Private Game reserve. 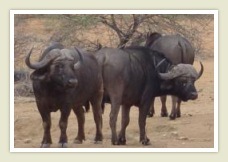 It extends your experience of the popular area in and around Kruger Park and the Panorama. Swadini Resort, on bed and breakfast basis. Dinner and drinks for own account. After an English full breakfast, we go for a boat trip on the Blyde Dam (Blyde Lake), spend some time at the Resort, and after lunch time, visit Moholoholo Rehabilitation Centre, where wild animals and birds are treated and rehabilitated. Late afternoon we return to our Lodge, for dinner time. Bed and Breakfast included. We depart early to enter Kruger National Park at Orpen Gate. Hunting by camera for the big 5 animals and the big 6 Kruger Park birds, we also take in the different other wildlife species, as we tour through this world-renowned National Park. After a whole day in the Park, we return to our Lodge. Bed and Breakfast included. 1) We depart back to Gauteng, stopping for interesting visiting points along the return route to our end destination. 2) Extend your stay with a visit to a world famous private game reserve, to encounter the wildlife at closer range, including a bush walk, with the accompaniment of some tamed cheetah or lion, and a game drive through this unique wildlife sanctuary. Contact us for any information about this tour or any other excursion or tour you may require. 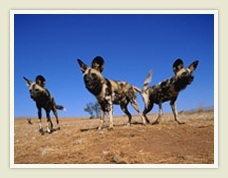 We will be happy to oblige to also compile any tailor made tour for you throughout Southern Africa. Tell us your needs. Combine any tour with another to extend your experiences. All our Guides are knowledgeable and experienced, registered Tourist Guides. CONTACT US NOW! Please note and discuss these options with us when you choose your tour, so it can be planned ahead, as it will influence the choice of accommodation area, and timing. There are many adventure outings that can be done in the area in and around Kruger National Park, especially outside the Park, in the Mpumalanga province and Limpopo province. All these activities are weather permitting. (A) Balloon ride: Early morning departure to the Balloon. Enjoy an exhilarating, quiet ride over the African landscape. (B) Elephant safari and interaction: Early morning outing for the Elephant experience of a lifetime, riding on an elephant in the African bush, where you may get in close proximity of any of the African wildlife. (A) Helicopter flight over Blyde River Canyon. (B) Visit the oldest Baobab tree in the world, followed by a visit to the world famous hippo, Jessica. (C) River rafting in the Blyde River or similar. ..and the list is seemingly endless..
Travel from Johannesburg/Pretoria to Mpumalanga province, directly on to the world famous Kruger National Park. Along the way on the Highveld, stop over at one of the Fuel stations on the N4 motorway. Once in the Park, we travel through the reserve on a photographic safari, looking out for animals in this unique wilderness area, where Africa's BIG 5 roam in their natural habitat. Overnight in one of the Rest camps on a bed only basis - for flexibility. The different eco systems in the Park provide for a tremendous variety of animals, insects, plant life, and birds. Overnight in Kruger National Park in one of the Rest camps on a bed only basis. Early morning game drive. Depart the park via the tropical fruit farming area of Nelspruit and the scenic Crocodile River Valley for our return to Johannesburg/Pretoria, to arrive in the late afternoon. Please feel free to contact us if you are interested in this tour package, or if you would like us to tailer make a package for you. CONTACT US NOW! a day around Swadini resort and the Blyde River Dam. and an extra 5th day includes a day on a Private Game reserve in the Kruger National Park area -- it is an experience really worth considering, seeing that you get a closer and more personal and photographic experience with the wildlife and the people of this region. 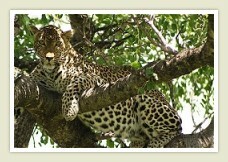 This tour is an extension of one day more in Kruger National Park, from the 3 day Kruger Park tour. The different eco systems in the Park provide for a tremendous variety of animals, insects, plant life, and bird life. Early morning game drive. Depart the park via the tropical fruit farming valleys of Mpumalanga for our return to Johannesburg/Pretoria, to arrive in the late afternoon. Please feel free to contact us if you are interested in this tour package, or if you would like us to tailor make a package for you. CONTACT US NOW!